With new artwork, new bedding, and spring in the air, it feels like a good time to style a light, textured bedroom. It's natural, airy, and happened to be created in a corner of our studio! 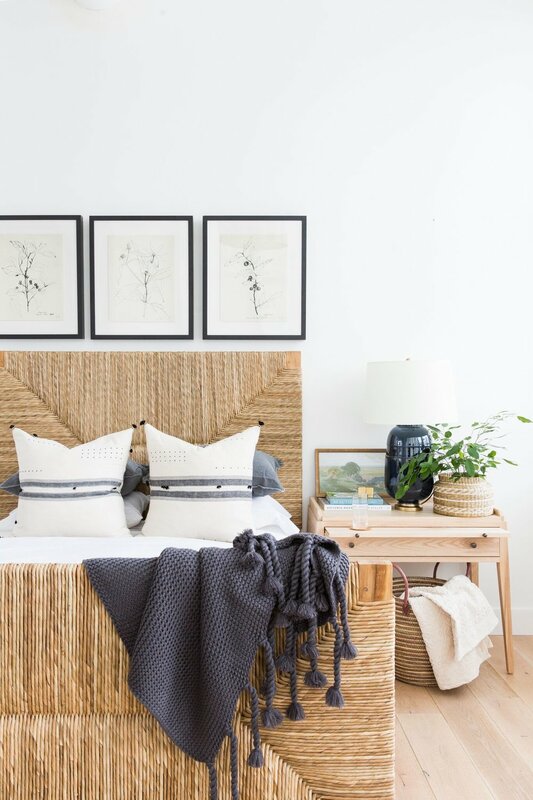 We used the Phoebe Bed, the Wyatt Nightstand, Tribeca Bedding, and head-to-toe McGee & Co. products. A body pillow grounds the bedding, and enhances the comfort of the whole bed. The nightstand is bursting with life. The thick woven textures in the planter and basket is contrasted by the rich tones in the vintage landscape and the midnight lamp. We used a soft quilt to keep with the light, natural tones in the space. For this look, we used the Samara pillow. Usually it's displayed upright, but we stacked it as a sham. The pleated edge detail that wraps the perimeter is shown off when they're displayed this way, bringing more texture to the space. To tie the look together and bring the eye in, we used one decorative pillow in the center. We used a striped quilt to subtly add pattern to all-white bedding. This result is bedding that is crisp and simple, with a touch of pattern. Our go-to white duvet cover is the Tribeca. For this look, we used a Seychelles White Quilt to create a tone-on-tone look that also has some texture.